Both the ACT and the SAT contain verbal and math question types. SAT/ACT Preparation Part I will give you all the information you need to do well on the verbal questions of the ACT and the new SAT. The ACT verbal sections are called the Reading Test, the English Test, and the Science Test. The Reading Test and the English Test assess your knowledge of English usage, grammar, and reading comprehension. This course will provide you with a grammar and usage review specifically geared to the rules that you'll be tested on in the ACT. You'll also learn how to maximize your time on reading comprehension passages and the passages in the science test. SAT/ACT Preparation Part 2 will give you all the information you need to do well on the math questions of the ACT and the SAT. The ACT math tests your knowledge of arithmetic, algebra, geometry, trigonometry, and basic statistics. This course provides you with a complete math review of all these subjects. We'll also show you how to use your time wisely so that you finish as many math questions as possible in the 60 minutes the ACT gives you for the math test. The SAT Suite of Assessments includes grade-appropriate tests with flexible scheduling options. Working together, these tests provide benchmarks and consistent feedback for measuring student progress, enabling teachers to adjust their instruction for students who are either ahead or behind. The PSAT 8/9: Taken in the fall or spring of eighth and ninth grade, the PSAT 8/9 serves as a foundation for understanding student progress as they enter high school and ensuring that they are on target for being college and career ready by the time they leave high school. The PSAT/NMSQT and PSAT 10: Both tests cover the same content areas. They serve as a check-in on student progress and pinpoint areas for development. Students can take the PSAT/NMSQT in the fall of 10th and 11th grade. Instead of delivering the PSAT/NMSQT to 10th-graders in the fall, some schools may deliver the PSAT 10 in the spring. 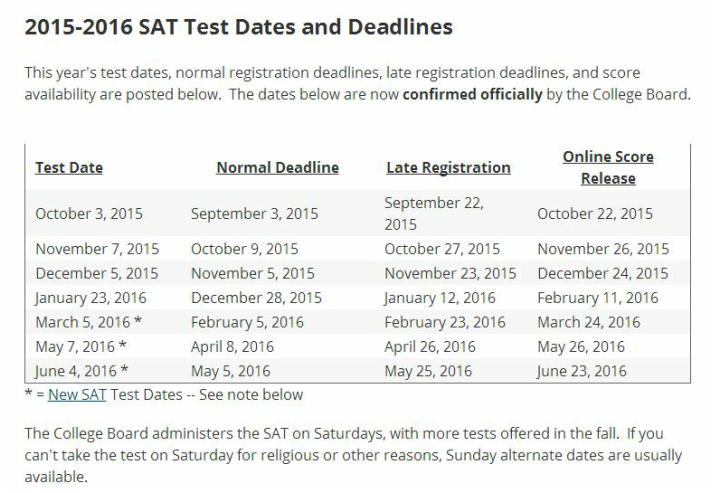 When to Take the SAT? Most students take the SAT during their junior or senior year of high school. At least half of all students take the SAT twice — in the spring as a junior and in the fall as a senior. Most students improve their score the second time they take the SAT. Students in 10th and 11th grade can take the new PSAT/NMSQT for the first time in October 2015. The PSAT 10 will be available to 10th-grade students in the spring. Students sign up for the PSAT/NMSQT and PSAT 10 with their school counselor. Benefits: The PSAT/NMSQT and the PSAT 10 cover the same content areas. Both tests provide students and educators with the chance to check in on progress toward college and career readiness and success. And both serve as an excellent way for students to preview and practice for the SAT, because they are tightly aligned with the new SAT. The new PSAT/NMSQT and the PSAT 10 will give students access to free personalized SAT study. With students’ explicit permission, Khan Academy will use their PSAT/NMSQT or PSAT 10 results to create a study plan especially for them. The PSAT/NMSQT is the official route of entry to the National Merit® Scholarship Program. The PSAT 10 will not be considered for entry. Over 3.8 million students took the PSAT/NMSQT in 2014. Schools can administer the PSAT/NMSQT to 10th- and 11th-graders on Oct. 14 or Oct. 28, 2015. 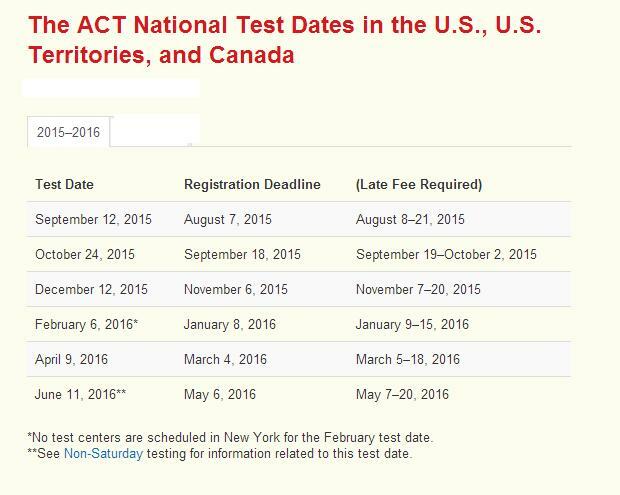 They can also give 10th-graders the PSAT 10 between Feb. 22 and March 4, 2016. The SSAT is the required admission test at many of the best independent schools in the world. This test is one important step on the path to an independent school education. Your SSAT score is one part of your complete application to an independent school; and while it is important, it is not the only criteria for admission. The SSAT is designed for students in grades 3 through PG and is administered on three levels (Elementary, Middle, and Upper​​). There are two types of SSAT test administrations: the Standard administration, which is given on eight designated Saturdays during the academic year at test sites around the world, and the Flex administration, which is an individual or group test administered on any date other than the eight Standard dates. The SSAT is designed for students in grades 3 through 11 and is administered on three levels. Each SSAT is divided into five sections: two quantitative (math), one verbal, one reading comprehension, and an unscored writing exercise. The SSAT for grades 5-11 also includes a section of experimental questions that, while unscored, is vital to the development of new tests.